Sep 30, 2011 in "Haunted Mansion"
A few hundred lucky guests spent an evening to remember yesterday at the Magic Kingdom in a special after hours event hosted by the official Disney Parks Blog. The event began at 8pm with check-in registration at Blizzard Beach, with a fleet of Disney Cruise Line busses transporting guests to the Magic Kingdom. The interesting geeky-stuff for fans began even before the event started as the busses entered the park backstage, and gave the attendees a glimpse of the parade floats and the backstage areas of Splash Mountain and Pirates of the Caribbean. Arriving at the Frontierland parade gate, the guests made their way through the park and into Liberty Square, the host land of the party. 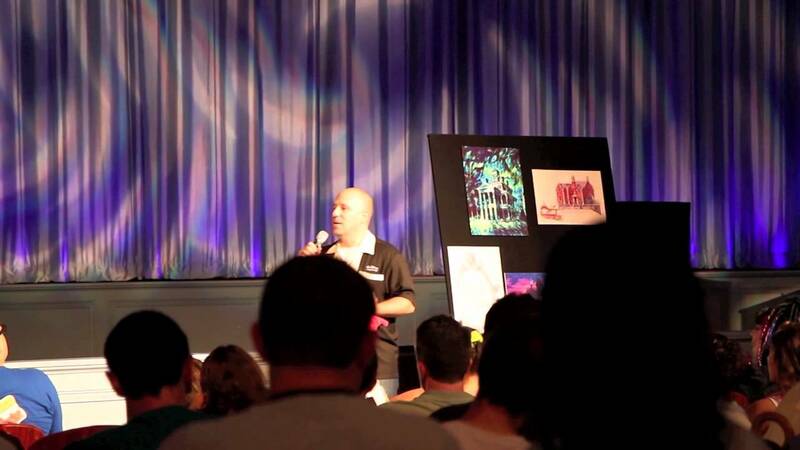 The party began in the Hall of Presidents with a welcome from the Disney Parks Blog team and a presentation by Walt Disney Imagineer Jason Surrell. Jason, who worked on both the 2007 and 2011 Haunted Mansion refurbishments, gave some great insight into the Haunted Mansion, and took questions from the guests. If you would like to see his presentation, check out our video here. His comments about bloggers were hilarious. If he ever wants a change of career, he has a future in stand-up! Following the presentations, guests were free to enjoy the party. 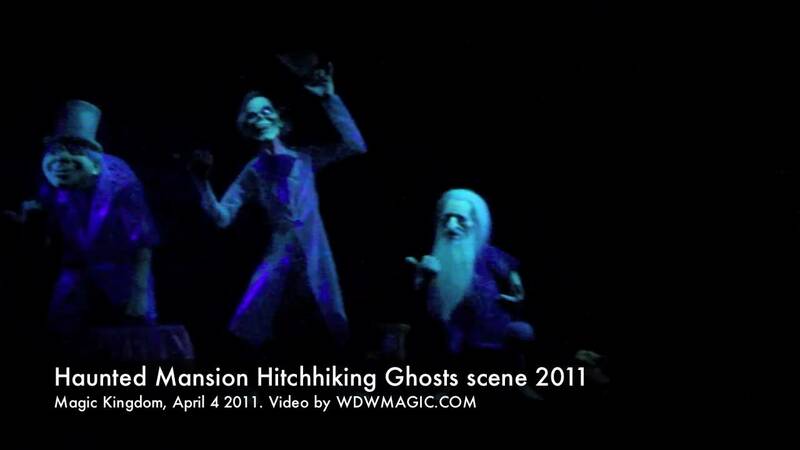 The Haunted Mansion was open for business, and was in full party-mode. Special lighting effects, area fog, live performers in the queue, and full makeup for the cast members in the area. There were trick and treat stations, character meet and greets with Dr Faccillier, Mickey and Minnie, Donald and Daisy, and all the streetmosphere. There was even musical entertainment on hand from the Halloween edition of the Dapper Dans. Special Halloween themed snacks were in plentiful supply - rice crispy treats, cheesecake and more. The highlight for many of the fans was the opportunity to take a tour of the Mansion queue with two of the key Imagineers involved in the recent upgrades to the Mansion, Show Producer - Eric Goodman and Pete Carillo, Show Designer and Art Director. Both Imagineers displayed their incredible passion for the attraction, and spilled some inside details around some of the parts of the new queue. One interesting story came from Pete who mentioned how they decided to make the myth of the bride's "ring" now an official part of the show. A contractor working on the queue thought someone had accidentally dropped a ring in the wet concrete and proceeded to dig it out. It resulted in them having to completely reinstall the ring and re-lay all of the concrete in the area! Apparent from both of the Imagineers was their overwhelming desire to preserve the history of the mansion, while at the same time moving it forward for generations ahead. They also both hinted that there was more to come! The finale of the evening was a ride through by the headless horseman. A fitting end to a wonderful night in the Magic Kingdom. The end of the night brought one more surprise, each guest received a Nightmare Before Christmas Vinylmation, and a special piece of Haunted Mansion artwork. Disney always put on a show like nobody else can, and once again the Disney Parks Blog organized a fantastic night. If ever you get a change to go to one of these events in the future, go for it, you won't be disappointed. Check out our photos below for a look at the event (as always, clcik the thumbnails for the large versions), and click here to view a video of the presentation by Jason Surrell.